Infused water is like creating art: it’s fun, it’s healthy, and its possibilities are endless. Nowadays, you will see all kinds of products on the market that turn your water into different colors and flavors. However, not only are their ingredients questionable, but they’re also downright unnecessary. 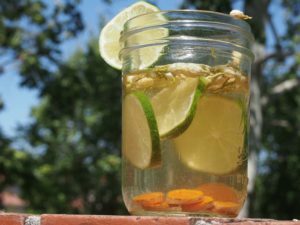 There are plenty of household ingredients you can make infused water with that you may already have in your kitchen or garden. From strawberry to thyme, apple to rosemary, it doesn’t take much to make your water a flavorful masterpiece. It’s pretty simple to DIY infused water. That said, there are a few tips and tricks borrowed from the mixologists of old to help you get the most out of your infusions. Sliced, squeezed, muddled, or mixed, fruits and herbs have different structures and textures that take one process or another to help get the most out of your preferred produce. With so many combinations, where to start? We’ve taken it upon ourselves to blend some of the most interesting flavors we could find.  Sure, there are plenty of recipes for mint and lime infused water out there, and even some benefits, and that’s why we decided to get a bit more adventurous. Citrus, berries, melons, and culinary herbs, all of our favorite ingredients are there to inspire you to make your own recipes. So without further ado, let’s get infused. An unlikely pair, blueberry and tarragon are actually quite an interesting match. Blueberry is a crowd favorite, but tarragon, commonly known as the “little dragon”, is a culinary herb appreciated for its unique taste and aroma of licorice and sweet basil. One of the four “fines herbes” of French cuisine (1), tarragon is also used as the primary flavoring for a soda called Tarkhun, widely popular in Eastern Europe. 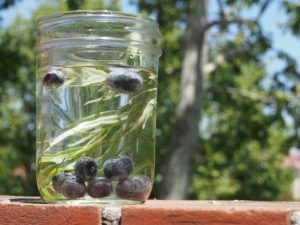 So it’s no surprise that infusing tarragon with blueberry is actually a match made in watery heaven. For infusion: steep anywhere from 1-4 hours for flavor. Blueberries can be steeped whole or halved to absorb more easily into the water. Tarragon can be muddled or steeped whole, as well. Strawberry is an obvious choice. But the fragrant addition of dill makes this blend a definite conversation starter. Dill, another culinary herb, is famous for its use in pickles, cooked with fish, and featured in everything from yogurt to biscuits. Because of its sweet, bitter, and citrusy flavor profile, dill blends well with just about everything. So why not strawberries? 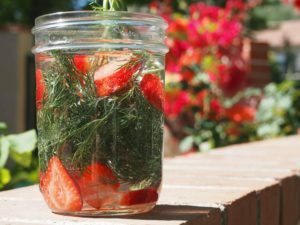 And on that flavor note, strawberry and dill already work well together in salad, so why not something as simple as water? For infusion: steep up to 4 hours for maximum flavor in cold or room temperature water. Strawberries are best sliced for better absorption. Dill is quite aromatic, so it should infuse rather easily. This pair is #3 in our trifecta of berry and herb combinations. Raspberry is a popular fruit flavoring for everything from breakfasts to beverages to desserts. Sage, on the savory end of the spectrum, adds a delicious flavor to meat to butter to honey. Together, these culinary powerhouses add a cool and refreshing take on infused water. And that’s not even to mention the medicinal benefits of raspberry and sage. For infusion: with raspberry being very porous and sage an aromatic leaf, infusing is a cinch. 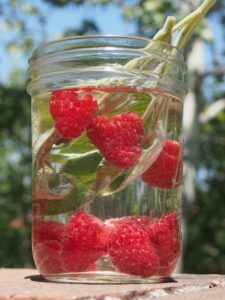 In cold or room temperature water, steep a small handful of raspberries and a sprig or two of sage leaves in filtered water from 1-4 hours. If you don’t already know about turmeric, it’s one of the most interesting culinary and medicinal flavors you can find. An anticancer powerhouse, turmeric is used in everything from teas and spices to pain relieving supplements, with a peppery, ginger-like taste. Lime, with a flavor all its own, is used from spices to beverages to pies. Jasmine, a fragrant flower with a rich history, has a perfumy flavor often added to green tea and all things “aroma”. Together, these three ingredients offer a deliciously, savory imbibe with a full range of complementary flavors. It’s great for conversation and those days where you’re searching for something outside the norm. For infusion: dealing with 3 different types of ingredients, this infusion requires a little more attention. Because turmeric is a root, it needs more time and heat to release its flavor. Either steep in hot water or leave in the sun with the jasmine flowers for several hours. Afterward, strain water and squeeze lime into the resulting infusion. Garnish with a lime slice or wedge. Oh, so much can be said about this combination. The most flavor-packed of any recipe on this list, cucumber-mint-strawberry-lime could be broken down into any smaller pairing and still be delicious. 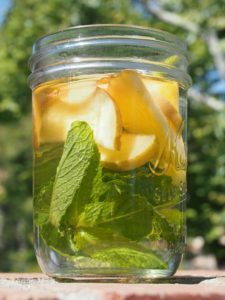 But together, these four offer a sweet, cooling, and especially refreshing infused water for those hot-as-Hades summer days. 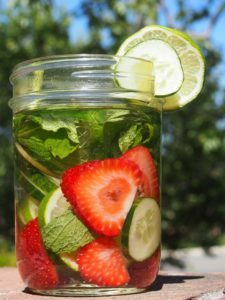 For infusion: slice cucumber and strawberry into thin slices, muddle several sprigs of mint in a cup. Steep all 3 in water for at least an hour in cold or room temperature water before squeezing lime for final step. Garnish with a lime wedge, and serve chilled. 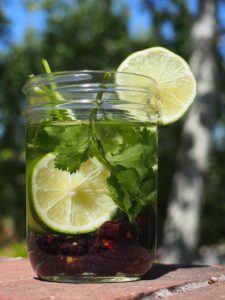 Another summer favorite-to-be, blackberry lime cilantro water has all the elements for a cool, calm, collected day. Blackberry is a sweet, tart, and nutrition-packed berry. Cilantro, an herb in the parsley family, is also loaded with nutrients and has a flavor many have likened to parsley and citrus. (2) Blended with the lime and blackberry, this is one surprisingly refreshing combo made for picnics and sun-soaked beach days. For infusion: soak blackberries in cold or room temperature water for at least 2-3 hours. Muddle cilantro and add to water at any time. Squeeze half a lime before serving. Garnish with a lime wedge and enjoy! If there were ever a colorful and fragrant combination, this delicious, flowers-only blend is most certainly your Huckleberry. Hibiscus, a tropical flower known for its Hawaiian charm, offers a deep red color loaded with vitamin C. Lavender, a culinary delight, offers a deep aromatic essence to everything from lamb chops to ice cream. And then there’s rose, the mother of all romantic flowers with its color, mystical, and practical connotations. Together, the combination is not only delicious and full of vitamin C, but it might also make you smell like perfume. 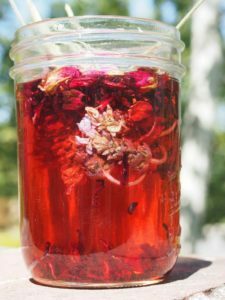 For infusion: steep all three in water, leave out in the sun for 2-4 hours. Hibiscus flowers will turn water deep red. Strain and enjoy! Raspberry and cucumber both have their refreshing qualities, but they are equally matched by the addition of fennel. Although fennel is closely related to parsley, carrots, dill, and coriander (3), its bulbs and feathery leaves carry more of a licorice and anise flavor. Pairing the cooling properties of cucumber and fennel with the sweet undertones of raspberry, it’s likely you’ll be happily hydrated wherever you are. 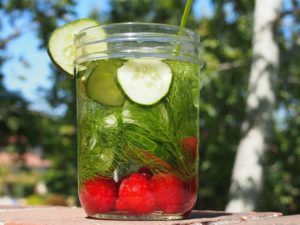 For infusion: cut several slices of cucumber, a small handful of raspberries, and 2-3 sprigs of wispy fennel leaves (or cut 1-2 slices of fennel bulb). Steep in cold or room temperature water for 1-4 hours. Watermelon is a standalone favorite. Cooling, hydrating, and full of lycopene, it’s no wonder this favorite melon has people waiting all year (like yours truly!) for summer. Paired with the unlikely match of cilantro, watermelon cilantro water is a dance of sweet, citrus, and herbacious goodness. 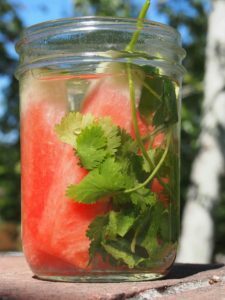 For infusion: Muddle a sprig or two of cilantro, slice several pieces of watermelon. Steep in cold or room temperature water for at least an hour. Not only are these two well-paired, but apple and mint each have their own varieties that can make for almost infinite combinations. Gala, Fuji, Granny Smith, and Red Delicious are just a few of the kinds of apples available (4), and chocolate mint, apple mint, ginger mint, and lemon balm are a few of the mint varieties to explore. (5) Although neither are foreign to any kitchen or garden, apple mint water should be a staple in every refrigerator. For infusion: cut several thin slices of apple, muddle mint. Steep for 2-4 hours in cold or room temperature water, and serve. Enjoy! 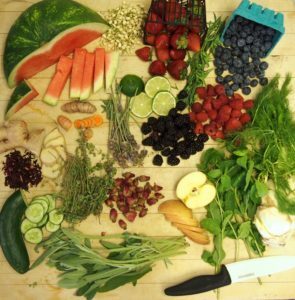 These are some of the more unique combinations of fruits and herbs we’ve been fortunate enough to put together in water. Although these blends are fairly novel to us, there’s really no limit to the new kinds of flavors you can create. Honeydew, yerba mate, D’anjou pear, and gynostemma are some of the more interesting types of ingredients you can find. But without giving away any more for now, go infuse yourself!